INTI Existing Students Only, including those enrolling students (applied and paid). Valid for April - June 2019 intakes. To participate, Referrers are required to fill up the Student Referral Form to participate in this program. Personal details collected from referrers will be used for payment processing when New Students (Referees) have successfully enrolled and paid the necessary fees to any INTI campuses in Malaysia. The Referrer & Referee must be Malaysian (Local). The Referrer must be currently an INTI student or a registered Applicant (applied and paid) of INTI International University & Colleges. The Referee must be notified and have consented to their details, personal data and information being passed to INTI for this referral program. The Referrer must not have any outstanding fees payable to INTI International University & Colleges in order to receive the referral reward. Each individual referee can only be referred to INTI once. In the event that a referee has been referred to INTI more than once, only the first person to refer the referee to INTI will be eligible for the referral reward under this Program. The Referrer will only be eligible to receive the referral reward if the referee successfully enrolled with INTI International University & Colleges. Referrer are required to log in online to get the referral code from the INTI online landing page and referee will acknowledge the consent form sent to the referee's email. The referral reward is not transferable to anyone. The referral reward is not applicable for short courses. The referral reward is only valid for new local enrolment at INTI International University, INTI College Nilai, INTI International College Subang, INTI International College Penang, INTI College Sabah and INTI International College KL. 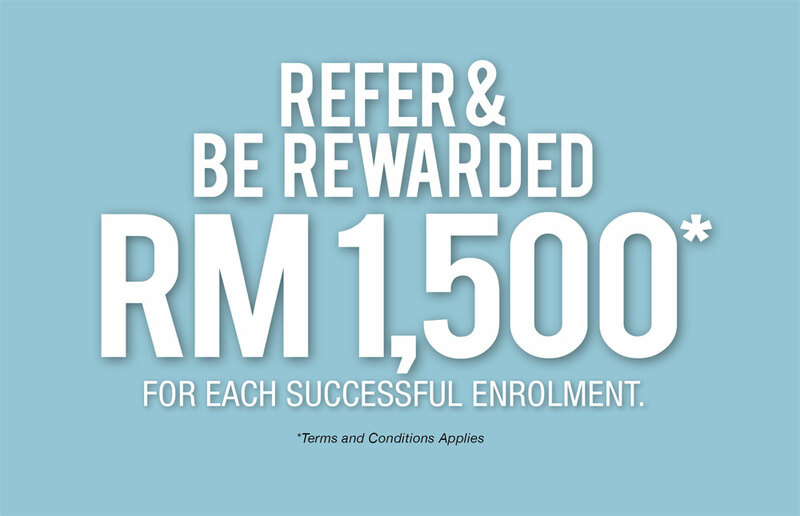 The referral reward amount per successful enrolment is up to RM 500. INTI reserves the rights to change the terms and conditions. All decisions made by INTI are final and binding.